So, Facebook is now rolling out their new timeline thing. I don't know if it will face the same amount of rage every time Facebook changes, but I sort of like it. It took some getting used to, but it's an interesting concept--plus you can have a cover. I went to go add a cover to my Facebook, and originally I was going to put concept art from UP (since I used that as my desktop BG), however; Facebook warned me it shouldn't be from copyrighted material..blah blah legal stuff. So, for once I decided to follow this guideline and was inspired to make a Christmas themed cover photo. Now I've been listening to Christmas Music almost non-stop for the last couple of weeks, and I just read a letter about how cool a "White Christmas" is. 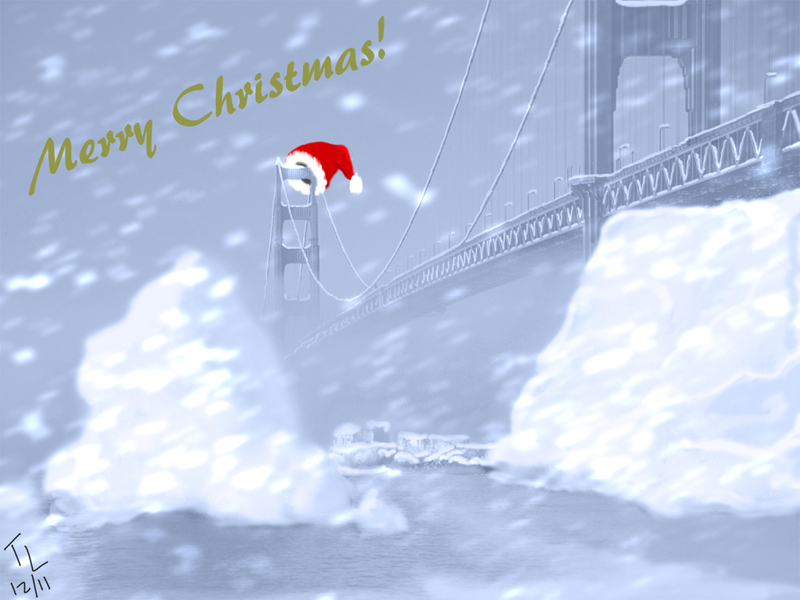 Well growing up in San Francisco I never got to experience a white Christmas, so I decided to paint one! I'm still playing around with digital painting (it's half photo and half painting), but I'm really happy with how this turned out. I may have made it a little too stormy looking, but I think this is the best digital painting I've ever done...so I'm still pretty psyched about it! Photoshop is really fun to play with! I can't keep waiting to experiment further!! Great Job Teresa! However, snow piled that high would be an absolute nightmare! Meghan and I have been listening to Christmas music since 5 days before Halloween so I can definitely relate! I'm working on a photoshop painting too that's xmas themed so I'll let you see mine too when I'm done!